I found a short college paper online written in French concerning the Paris Expo (note: the whole website has disappeared as of April 2013) . This paper discusses the indigenous people that participated in the expo. My interest was caught by one sentence. It said “a group of American Indians was brought by an American circus”. I was unsuccessful in determining who wrote the paper or when it was written. Although the paper lists three items in the bibliography (all in French), I was unable to determine which may have contained the circus information. I am wondering how much trust I should place in this one sentence? So, I keep researching, looking for evidence to collaborate this. In a column dated April 26, 1867, a New York Times correspondent in Paris mentions the recent arrival of two Indians and something about them selling out to a circus. I will reprint this article in my next post and only mention it here because it establishes a date they have recently arrived in Paris. 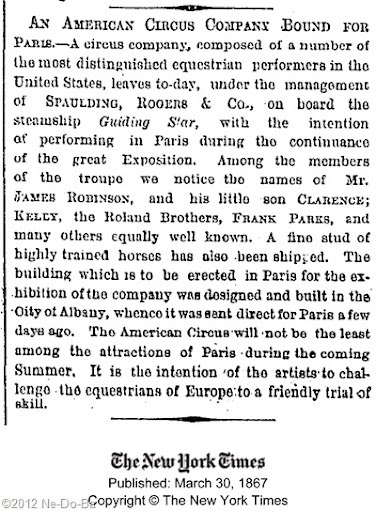 AN AMERICAN CIRCUS COMPANY BOUND FOR PARIS – A circus company, composed of a number of the most distinguished equestrian performers in the United States, leaves to-day, under the management of SPAULDING, ROGERS & Co., on board the steamship Guiding Star, with the intention of performing in Paris during the continuance of the great Exposition. Among the members of the troupe we notice the names of Mr. JAMES ROBINSON, and his little son CLARNENCE; KELLY, the Roland Brothers, FRANK PARKS, and many others equally well known. A fine stud of highly trained horses has also been shipped. The building which is to be erected in Paris for the exhibition of the company was designed and built in the City of Albany, whence it was sent direct for Paris a few days ago. The American Circus will not be the least among the attractions of Paris during the coming Summer. It is the intention of the artists to challenge the equestrians of Europe to a friendly trial of skill. the circus was managed by Spaulding, Rogers & Co.
MARCH 30 – In steamship Guiding Star for Harve – Mr. and Mrs D. Bidwell, G. C. Quick, Ed. Darius, New-Orleans; Miss May Saul, H. M. McCracken, Miss McCracken, Columbus, Ohio; Robert Stehns, Frank Pastor, George M. Kelly, Henry Rolland, Ed. Walcott, Wm. Lystor, Mr. Catlin and assistant, Lewis Carr, four grooms, Indian and wife, Mr. and Mrs. Wild, California, and 23 in second cabin. In 1867 a scheme was devised to send an American circus company to Paris, France, to perform during the Exposition. The manager and capitalists were Avery Smith, Gerard C. Quick, John J. Nathans, Dr. G.R. Spalding and David Bidwell An edifice in which they were to have performed was built for the purpose by Mr. Kennedy of Albany, N.Y. It was of wood, with a canvas top, and had the following capacity: Forty-four private-boxes, besides an imperial loge, seven hundred and sixty parquet seats, fourteen hundred and twenty balcony seats, and a gallery capable of accommodating nearly two thousand persons, the seats being all cane-bottom chairs. Col. Van Orden had been sent in advance to Paris to prepare the way for the company, which was very strong. The chief attractions, according to the files of THE CLIPPER, included James Robinson and his son Clarence, Frank Pastor, Robert Stickney, G M. Kelly, Lorenzo Maya, the Rollande Brothers, Wm. Conrad, Charles Rivers, the performing horse Hiram, a performing buffalo, and a troupe of Indians. Most of the company and all the stock, consisting of twenty-three horses, two mules, and a buffalo, also four horses belonging to James Robinson, left New York in the steamship Guiding Star March 30, 1867, David Bidwell and Gerard C. Quick accompanying them. The other performers followed in steamships that sailed at later dates. After arriving in Paris, and when nearly all the preparations for their showing had been made, it was discovered that a local law prevented the erection of any wooden building within the city limits; consequently they could not use their pavilion, and, all other places being engaged, the venture was about to end in failure, when fortunately opportunity was given the American company to play for a brief time, but the result was not what had been expected. This item excerpted from an undated and unsourced posting on Find-a-grave which appears to be an obituary for Mr. Spaulding and perhaps published in The Clipper. This document in packed with nice details, but to keep this blog post a reasonable length, I will not list them here. I provide it here because it collaborates well with my other sources and it specifically mentions troupe members by name and includes mention of Indians as a part of the circus troupe. It is also of interest to note this circus includes mustangs, buffalo, and Indians. The only thing missing is a few cowboys and it could be called a Wild West Show. But that type of entertainment has not been invented quite yet. The Circus Historical Society website is a wonderful resource for early circus history. This website has a very nice selection of biographies for early circus entertainers, acts, managers, etc.. Using this resource, I was able to learn more about the Paris troupe members traveling with U-ta-wa-un. The Circus Historical Society frequently refers to this particular circus as the “Parisian Circus, assembled for the Paris Exposition”. 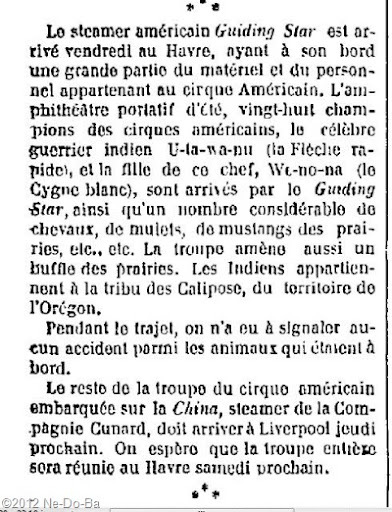 The New York Times correspondent in Paris refers to it as the “American Circus” and I have located period material in French mentioning the “Grand Cirque Américain” at the “Théatre du Prince-Impérial”. How can I be sure this “Indian and wife” traveling with the circus is U-ta-wa-un and We-no-na? Well folks, I do have more evidence, such as this next document, but I will save the really good evidence for a later post. The american steamer Guiding Star arrived Friday in Havre, having on board a large part of the equipment and personnel belonging to the American circus. The portable summer amphitheater, twenty-eight champions of American circuses, the famous Indian warrior U-ta-wa-nu (fast arrow), and the daughter of the chief, We-no-na (the White Swan), arrived by the Guiding Star, as well as, a considerable number of horses, mules, prairie mustangs etc., etc.. The company also brings us buffalo of the prairie. The Indians belong to the tribe Calipose of Oregon Territory. During the trip, we did not have to report any accident among animals which were aboard. The rest of the troupe of the american circus embarked on the steamer China of the Cunard Company to arrive in Liverpool on Thursday. It is hoped that the entire troupe will be reunited next Saturday at Harve. This document contains the ship name, the arrival port, and mentions the circus was onboard. This ties beautifully with the departure information collected in New York and the recent arrival mentioned by the New York Times correspondent. I can use my date calendar to determine their arrival date. They arrived on the Friday before the publication date, which would be April 12. Of course, the really important item is the mention by name of the two Indians on board. This last document directly connects my friend, U-ta-wa-un, with the American Circus. It is interesting to note the story they are telling reporters when they first arrive in France. Well, I’ll be – Google suggests there might be a Calipose Mountain in Oregon. However, in other advertising materials I find his “tribe” spelled Calipoose. In either case, I find no record of any such tribe. It sounds exotic and makes for a great story! I just love it when all the pieces fall in line. Of course it has taken me untold hours and days to find all the little pieces of this puzzle and I have no doubt plenty of pieces are yet to be found. Still, I have enough pieces for the picture to come into focus. Some of my readers may be asking – why is any of this important to a genealogy project? It is important because I have what is commonly referred to as a brick wall that needs to come down. I do not know where any of the members of the Kanistanaux family are during the 1860s, so I need to research any possible clues. U-ta-wa-un is one of the clues I am following. This Paris Exposition is very well publicized and I have good evidence this man was there. This event occurs during my mysterious 1860s period. By researching U-ta-wa-un’s involvement, I may be able to learn more about him and discover the identity of his traveling companion (I have a hunch she is Marleah Kanistanaux). In addition, I need to learn more about circus in the 1860s, since the obituary of Laton Kanistanaux suggests he traveled with a circus before settling in Stockton. However, I don’t know what circus, so where to start? This Indians in Paris research has provided me with an excellent starting point for Laton’s circus research. 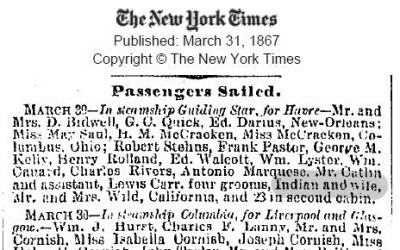 It has given me the names of circus people and managers U-ta-wa-un (and perhaps Marleah) is associating with in 1867, just 3 years prior to finding him and Marleah traveling together in New York state. Learning more about these circus folks may turn up news items, biographies, photos, etc. and this may in turn lead me to new clues or if I am very lucky – some answers.